Many of the nation's small companies aren't waiting around for Washington to rescue them from the dire economy. Instead, determined entrepreneurs are figuring out smart ways to grow their revenues and keep profits up at a time when everything -- from tight credit to rising health care costs -- seems stacked against them. Launching a clothing line in the middle of the downturn might not seem like a smart move for two former financial services industry professionals without any fashion experience. But longtime friends Charlie Roth and Owen Schnaper have done it successfully at Chicago-based Salmon Cove, a retailer and wholesaler of men's and women's polos and other casual clothes aimed at the country club set. Founded in 2010, the company already projects more than $1 million in sales for the next 12 months. They've done it by bypassing department stores and selling their profitable line -- for which they've worked with experienced designers -- on their website and through the pro shops of about 40 of the nation's leading country clubs, as well as upscale local clothing boutiques in well-off towns. "The demographics are affluent with an active lifestyle," says Schnaper. 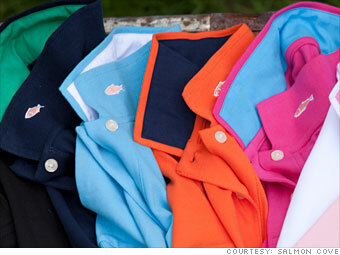 And, while many consumers have cut back on clothes shopping since the downturn, the country club set is still spending.